View all your artifact's progress, and solve them in one compact frame. Also you can view all your artifact's history neatly sorted by race, and a list of digsites. You can left-click the keystone button to attach keystones (or right-click to remove), or if you prefer there are options to automatically use keystones! You can monitor the artifacts progress, or how close you are to the 200 fragment cap. Development will continue over at Curse. (08.11.11) - Updated the ToC to 40200, unfortunatly I have not had any time for WoW or this addon and probably won't for a while, if you or someone you know is interested in helping me with the addon send me an email/pm. (04.27.11) - Artifact progress bars should be more reliable, Added zone information to the Active Digsite Indicator, Fixed crash when MinArch and Blizz Arch were open at the same time, and some more smaller stuff. (04.15.11) - Cleaned up over 90% of the code so it's possible that I broke something, added a couple new features, including monitoring the 200 fragment cap. Fixed the progress bars, although sometimes the texture isn't applied, ('/console reloadui' usually fixes it). 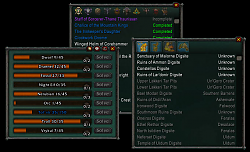 Added artifacts sale price to the tooltip. (01.10.11) - Fixed a couple of bugs relating to history and added Discovered Date and Number Discovered (if relevant) to the main Minimal Archaeology frame. 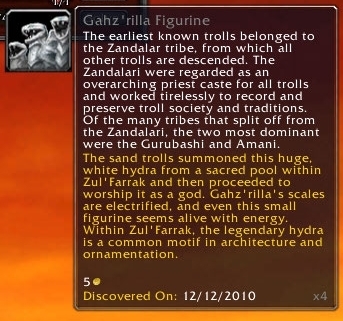 (01.09.11) - Added a missing artifact to the dwarf history page. (01.08.11) - Hopefully fixed a couple of small bugs. Added a history frame (who needs the default ui anyway), if I've missed an artifact or made any mistakes with this please let me know. (12.24.10) - I forgot to update the toc, so this version still reports 12.23.10-2, sorry about that. Small bugfixes, added tooltip to keystone button to indicate available keystones (might need a little bit of work still). 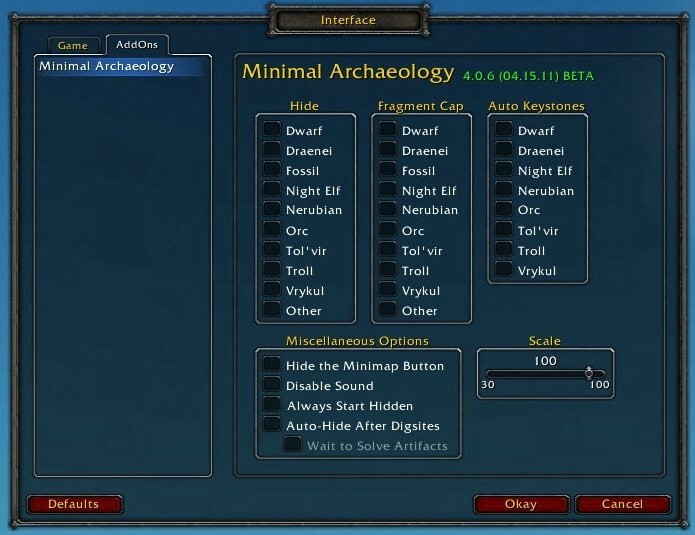 Also added keybindings to show/hide minimal archaeology, and to survey. 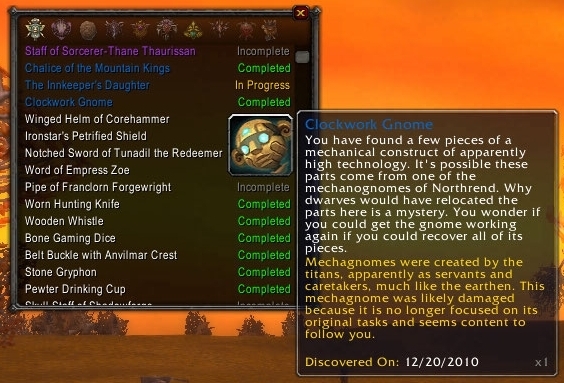 (12.23.10-2) - Fixed a bug that had and an archaeology icon floating next to the tooltip. (12.23.10) - The skill bar should now hide when at max level. Added a button to open the default interface. Added a small distinction between fragment progress and progress gained with keystones. Also text for rare items should be colored blue. Added the artifacts icon to the lore tooltip. Small bugfixes. (12.22.10) - Added the option to scale the Minimal Archaeology frame. Also added an option to wait to solve artifacts before auto-hiding after completing a dig site. (12.21.10) - I did some major code cleanup, I'll do this every once-in-a-while since I get better as I go, and it makes the code a lot easier to work with. Also implemented an experimental fix for users that were experiencing initializing nil values. Last but not least, I added two new options, one to always start hidden, the other to auto-hide after completing a dig site (I need to expand on this and will). Also right-clicking the minimap will bring up the options panel. 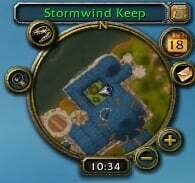 (12.20.10) - Use keystones by left-clicking the keystone button, remove them with a right-click. Options to automatically use keystones. (12.19.10) - Fixed the issue with the sound repeating. Adjusted the lore tooltip. The frame now remembers what state it was in at logout (so if it was closed when you logged out, it will be closed when you log in). Added an options panel which allows you to hide specific artifact bars, the minimap button and disable the notification sound. Bars sometimes don't have a fill texture '/console reloadui' sometimes fixes this. Please contact me (post a message, pm me, make a ticket, etc...) if you are experience bugs, please include as much detail as possible. - Cleaned up a lot of code, may have broken things, but I haven't found them yet. 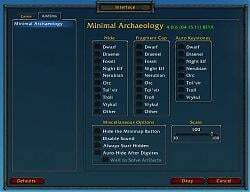 - Fixed bug where Minimal Archaeology would not get the proper information about available keystones. - Fixed bug with conflict between Minimal Archaeology and the default History frame. - Fixed a few other bugs relating to history. - Added details about completed artifacts to the main tooltip. The development of Minimal Archaeology will continue over at Curse. Look there for any updates! Is it hard to post updates here on WowInterface? Or something prevent you from doing this? You don't like people using your addon, perhaps? MoveAnything uses MAOptions as a global xml frame object. This MUST be fixed in MoveAnything. You SHOULD name your frames "...Frame" to avoid such conflicts in first place, however potential or unlikely you deem them. Thanks for the neat addon. Just reporting a conflict with the addon MoveAnything because they both use the declaration of "MAOptions". MinimalArcheology uses MAOptions as a global variable. MoveAnything uses MAOptions as a global xml frame object. MinimalArcheology works okay with this conflict because variables always exist. Unfortunately, MoveAnything thinks MAOptions can show the options window but ends up showing the variable which is obviously impossible. If the name was a little different between the two addons, it could help. Lately I have been recieving a bunch of emails relating to this and many other issues, unfortunately I am not likely to fix these, however if you or anyone you know might be interested in taking over the project please let me know. Until someone can be found to take over the project, I am afraid there is no ETA for any fixes. Last edited by jtbalogh : 09-03-12 at 01:22 PM. The only problem I've noticed so far - bar couners are not updated correctly upon assembling artefacts. If, say, current artecact have 30 frabments, next could be, say, 45 and you have 49, bar will show 19/30 upon assembling of current artfact and will take some action to correct itself. One another issue - inconvenience, mostly - it does not remember last frame state and will always start open. Just uploaded a very simple LDB toggler for this beauty. Is it possible to get data broker support on this addon? i would love to be able to have a hide/show icon on my data broker bar. This addon doesn't even work for me ever since the patch (and yes, I have the latest version of the addon). Any time I have it enabled, the loading screen when logging in stops about a quarter of the way through, then I have to close the whole game via the task manager. I've tried re-enabling it while in the game, but when reloading the UI, it freezes again. I don't get any errors, it just locks up the whole game. is there support for tomtom? 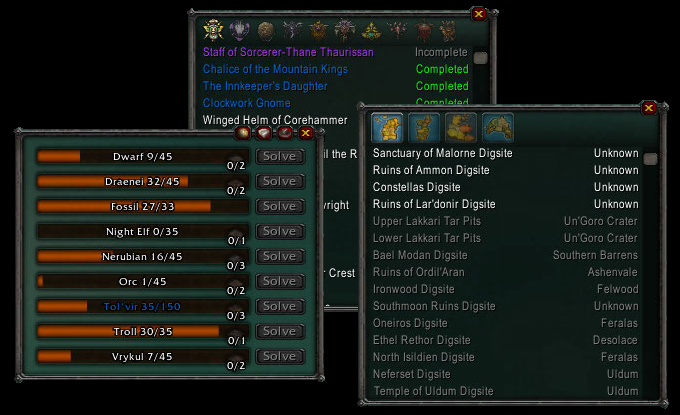 I could have sworn that before the addons bars would fill up a certain color as you completed the projects. Now they are all solid black. Am I mistaken? If not, any fix? This is a known issue, which *might* be fixed in the next version (hopefully released later today), atm the only thing I can recommend is '/console reloadui' which will sometimes fix it. All donations are greatly appreciated, if you would like to donate a link to my paypal can be found on the [url= page[/url] for this addon.